Browse: Home / Relics of Lebanese saint revered at Maronite cathedral in Brooklyn, N.Y.
Relics of Lebanese saint revered at Maronite cathedral in Brooklyn, N.Y.
BROOKLYN, N.Y. (CNS) — Fragrant flowers, hymns and prayers from dozens of the faithful welcomed the first-class relics of Lebanese St. Sharbel Makhlouf at Our Lady of Lebanon Maronite Cathedral as part of a tour throughout the East Coast. 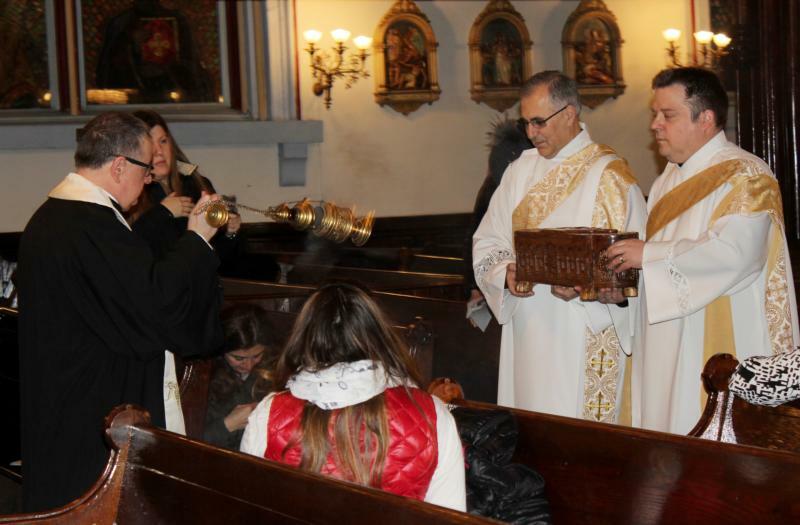 The cathedral, the mother church of the Eparchy of St. Maron of Brooklyn, displayed the relics April 9-10, one of several events commemorating the Year of Mercy declared by Pope Francis. Subdeacons Norbert Vogl and Peter Frangie carried an ornate wooden box containing the mortal remains of the Eastern Catholic saint in an outdoor procession from the rectory to the church. Msgr. James A. Root, cathedral rector, incensed the relic as they passed through the Holy Door of the cathedral before being placed at the foot of the altar. The relics are on their first U.S. tour to mark the 50th anniversary of the saint’s beatification. The tour was to continue to parishes in Massachusetts, New York, Pennsylvania and North Carolina through June 5. Maronite Bishop Gregory J. Mansour took a few moments to venerate the relics before hearing confessions. The cathedral also welcomed Dafne Gutierrez, an Arizona mother who offered testimony of regaining her sight through St. Sharbel’s intercession after praying before the relics in January. She stayed a few days after the relics left to bring her story of healing to visitors. Born Joseph Zaroun Makhlouf May 8, 1828, St. Sharbel was raised in a poor but devout family in northern Lebanon. Ordained a Maronite Catholic priest July 23, 1859, he took the name Sharbel in honor of a second-century martyr. He lived an ascetic life as a hermit for 23 years until his death Christmas Eve 1898. When his body was exhumed later, it was found not only to be incorrupt, but also secreting blood and sweat. Pope Paul VI beatified the monk at the conclusion of the Second Vatican Council, and canonized him Oct. 9, 1977. His feast day is July 24. Thousands of graces and miracles have been attributed to the intercession of St. Sharbel, called the Padre Pio of Lebanon by some, and likened by others to St. Therese of Lisieux for his widespread influence, although he never left his hermitage. His reputation for holiness has encouraged people of many faiths and ethnicities to seek his assistance in bringing their petitions before God. “We also must seek out holiness, spirituality, a true metanoia, a true change of heart, a conversion, in order to allow God to work within us and among us,” he said. Parishioners and visitors from the New York metropolitan area sought out the 19th-century saint at the cathedral. The reliquary rested upon a wooden table as devotees presented themselves, two by two, to offer prayers of petition and thanksgiving. “You come with a purpose in your hands and your heart, and he touches us in different ways,” said Aida Abundo, a parishioner at St. Teresa Church in Manhattan. As she venerated the relics, she prayed for her father and mother, ages 94 and 85, respectively, and her sister back home in the Philippines who takes care of them. Sabrina Ridore, Elsie Louis and Evelyn Audouin, members of Mary, Queen of Heaven Parish in Brooklyn, read about the visiting relics in a news report and decided to attend. “This is my first time hearing of this saint,” Louis said, explaining how she was moved by his life story and the way he removed himself from the world to grow closer to God. Audouin was more acquainted with Sharbel. She brought a prayer booklet from St. Sharbel Chapel in Port-au-Prince, Haiti, so she could offer prayers in her native Creole language. Thomas Upshur from St. Mary of the Isle Parish in Long Beach, New York, asked the saint to intercede in the lives of his children. “I come here today to offer my children to him that they may receive the light of Christ because they’re so far away,” he said.